The Oyo State Police Command have paraded a 20-year-old Ibrahim Babatunde for the abduction of his father. Babatunde said he was the architect of the crime and that he did it with three other accomplices. Other members of the kidnap gang were Babuga Salihu, 20, Aura Sands, 20 and Amuda Yusufu, 19. The state Commissioner of Police, Abiodun Odude, said Aliyu Babatunde was abducted in Igboora and spent three days in the den of his abductors. He added that he was released after the family paid N1 m ransom. 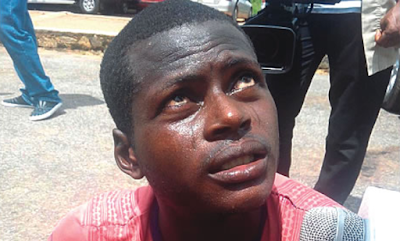 The 20-year-old said he was lured into kidnapping after his father turned a blind eye to the welfare of his children. While revealing how the crime was planned and executed, Babatunde said he invited his friends after he was sure that the plan would succeed. Odude said, “The victim was eventually taken to an unknown place where he was kept for some days by his abductors who later demanded ransom as a condition for his release.